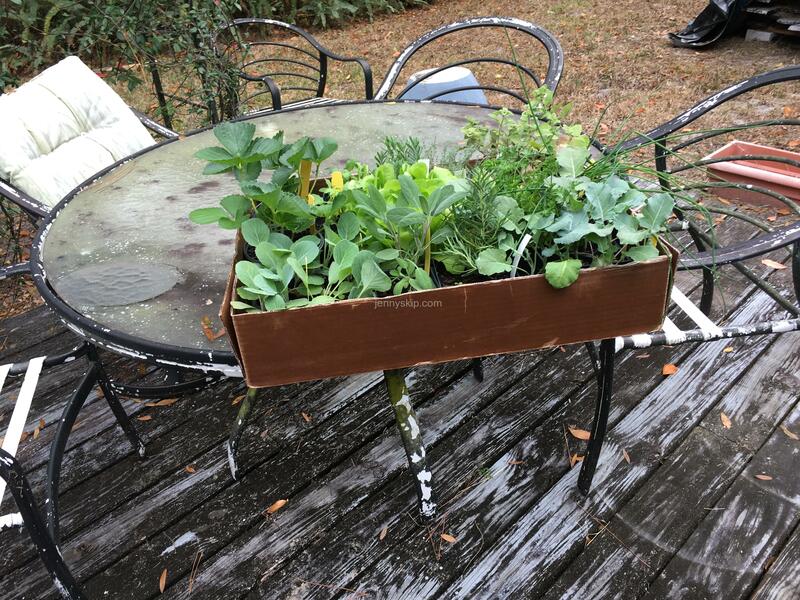 As you may have seen from our previous post, we’ve gone all out for planting a raised-bed winter garden. 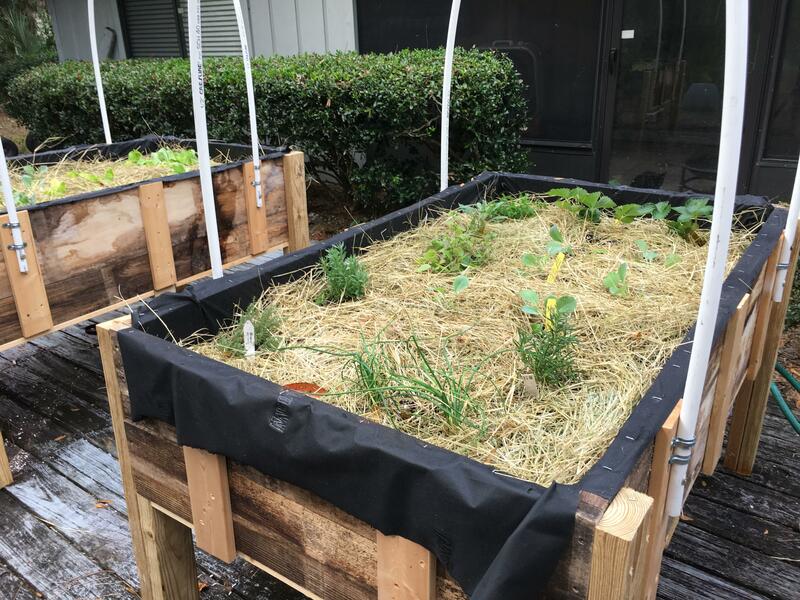 In the prior blog entry, we go through the process of building the planters out of wood harvested from our own back yard and bolstered with our daughter-in-law’s no-longer-needed bed slats, and filling them with nutrient-building amended potting soil. We have great hopes that the planters will make it easier and better on us oldsters, to be able to maintain a home-grown garden. The planters are about waist-high, so we’re saying “no” to back-breaking shoveling, hoeing, and bending over to weed. Today I picked out some winter veggies from our local Garden Center that are supposed to work for our growing season, although technically, I’m told the optimal time for planting the winter crop was last month. We will see if we can keep our little project going. We have a couple of strawberry plants, various herbs, lettuce, arugula, broccoli, and a couple of different types of cabbage. We like greens, which would be an acceptable winter crop, but for me, lots of collards, turnip greens and kale are a dietary no-no (kidney stones). The weather report says we’re not supposed to have a freeze any time soon. About a week from today, it says, the temperature is supposed to go down to 35 F at night. 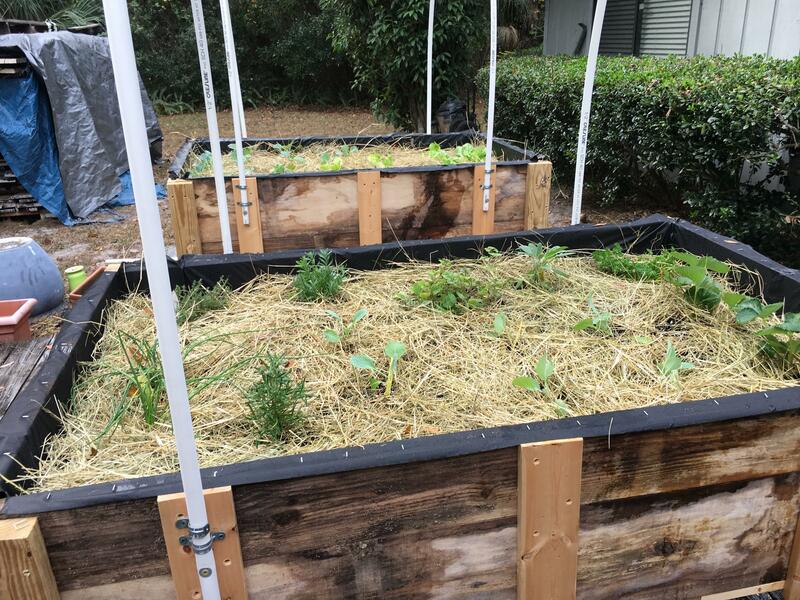 The hay that we’re using for mulch will keep the moisture in the soil, and if it rains very hard, will prevent the dirt from splashing up onto the plants. Hopefully our shade cloth that is on order will get there by then so we can be ready to protect these little babies! So well built, the will be protected nicely! What a great project. I love the fact that you are doing this with recycled items. It is so hard to think of it being winter in the northern hemisphere, whilst I am sitting here in a singlet top with the aircon on in Australia. Well done you! My garden is also out of sight – it’s a half hour journey away! But I find it does my soul good to spend time there so I just naturally want to go. I hope your garden does the same for you.